The number of warnings flagged against used vehicles checked by Mycarcheck.com has risen year-on-year. Its report by reveals the write-off, finance and stolen risks for its 20 most-searched makes. The percentage of vehicles checked with at least one serious warning against them increased from 25.6% in 2015 to 28.5% in 2016. The most common serious risk - write-off - increased from 29% of all warnings in 2015 to 33.6% last year. Outstanding finance accounted for 18.1% of all warnings, up markedly from 13.8% in 2015. The risks differ from make to make. 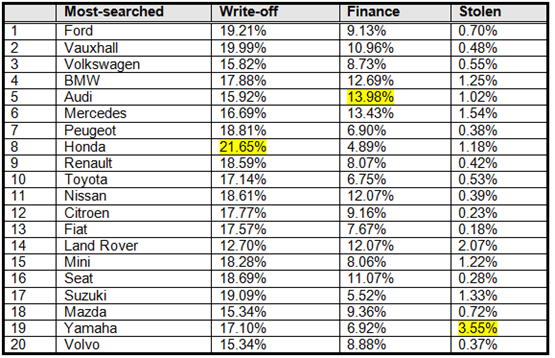 For the second year running, Honda was worst for write-off and Audi was worst for finance. New entry in the top 20, motorbike and scooter manufacturer Yamaha, was worst for stolen. 21.65% of all Honda vehicles checked returned a write-off warning, compared to a mycarcheck.com top 20 average of 17.61%. And 13.9% of all Audi vehicles returned an outstanding finance warning, compared to an average of 9.32%. 3.55% of all Yamaha vehicles checked returned a stolen warning, compared to an average of 0.92%. Head of Mycarcheck.com Roger Powell said: “Buying a used vehicle should be exciting, but the private marketplace especially is fraught with risks. CDL Vehicle Information Services, which owns mycarcheck.com, performs over a million look-ups a day for companies including AutoExpress, CompareTheMarket, Go-Compare, Moneysupermarket, Swiftcover and Tesco.